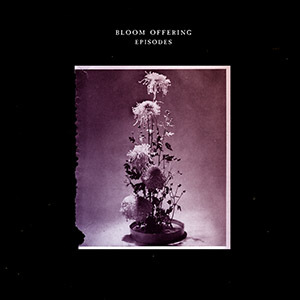 Brainwashed - Bloom Offering, "Episodes"
When Jim Haynes, head of the always fascinating Helen Scarsdale Agency, told me he would be releasing an almost pop record on the label, I was a bit surprised. Here is a label that, over the past 15 years, has perfected the sound of rusting, rotting audio. But with recent Ekin Fil releases hinting at a growing interest in musicality, the idea began to seem less bizarre. The first proper vinyl album from Nicole Carr (also known as Bloom Offering) fits perfectly in this niche. More conventional sounding than usual, but still experimental and challenging in its own way, it is a brilliant record that stands out among the best albums this year. Probably the best reference point to describe the overall sound of Episodes is reminiscent of Suicide. Mostly in that Carr constructs slowly evolving layers of hypnotically repetitive electronics that tend to build unrelentingly, with her production and vocals giving a dark, sinister sheen to the whole thing. This is apparent right from the beginning of "Swallow Me Whole", with Carr’s distant, detached vocals spread atop a heavy kick drum, clanging snare, and brittle synth sequence. "Fit of a God Complex" uses the same elements, but with a slower tempo and a drift towards greater abstraction at the end. In addition to these more rhythm-centric pieces, Carr is no stranger to adding some melody to the mix as well. Bent voices and heavier beats may be at the core of "Imperfect Absence", but the depressive melodic progression that is blended throughout is the defining facet of a great song. "Fishbowl" has a similarly melodic structure, but one that is a bit more uptempo in comparison, keeping things dynamic while still fitting within the overall sound of the album. The same goes for "Simple Math", which may begin in a very sparse place, packed with pitch shifted voices and Carr repeating the title of the song, but eventually locks into an faster tempo with some excellent arpeggiated synth sounds. The whole record is amazing, but the pair of distinctly different songs that open the second side really drive home the variation and complexity that defines Bloom Offering. "Venus Shrugged" is all distant, rattling thuds and vast, yet menacing spaces. Eventually Carr fleshes out the song a bit, but it is still an intentionally stripped down affair. This is immediately followed by "Out 2 Get U", which has some 1980s drum programming sounds befitting its Prince-esque titling, but the remainder is a nasty FM synth bass lead and hard, thumping beat. It may be a bit less experimental than some of the other songs here, but it is so well done, and with such a dirty, aggressive production to it, that it makes for a high point of the record. While compared to some of the other releases on the label, Episodes may seem rather conventional, but Nicole Carr's take on stripped down synth menace and aggressive is just as challenging in its own right. It is a catchy and memorable synth heavy album, but one that carries a lot of its own emotional weight and darkness. It is this combination that made it stand out so strongly and has placed it among the best records of 2018 in my eyes.